I don’t know why I put so much time into it this year, but I felt like kicking it up a notch. Plus I decided over the summer that my apple tree looked lame without leaves. And I couldn’t find an apple die to cut out the shapes, so since I was definitely not doing this tree by hand like last year I went with leaves instead. Surprisingly, finding a leaf die was big drama, too. I just bought a Cuttlebug a few weeks ago for some home crafty projects I’m excited about, but I couldn’t find a leaf die big enough. Actually, first I spent ages looking for an apple. Then a leaf. This is after I scoured work looking for our die cut machine with no luck. After all this searching, I finally thought to ask a custodian where the machine was (they would have been the ones to move it, after all). It was hidden, but I found it. Along with a just-right leaf die. So I cut out a ton of leaves using my own personal stash of patterned papers. 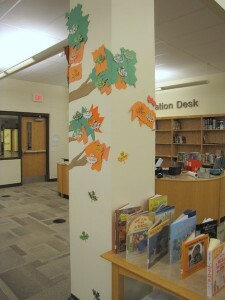 Then I spent hours after school Friday and today cutting up construction paper to fill in the “leafy” space and give it some oomph. This tree wraps all the way around to the back of the column, which is new this year. 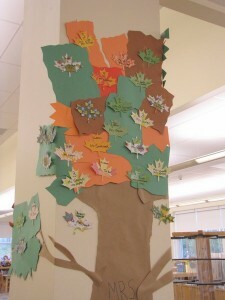 That’s because my student helpers made big, fabulous branches. 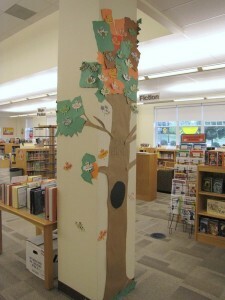 Again, the kids made the trunk and branches of the tree. I made all the leaves and foliage. Sometimes the dedication I have to my projects is staggering. Especially since it will be changed in 2 months for winter. But it’s done, and just in time for Back to School Night tomorrow!